Everyone knows that we need fibre in our diet, and many of us make sure that we eat bran flakes or wholemeal bread during the day to keep our fibre intake high. Few of us, however, know why fibre is so important to our diets – and where we can get it, apart from the obvious. Did you know, for example, that fibre can be found in many fruits and vegetables – not only in lentils, grains and pulses? Fibre can be found in many foods – it’s the group of complex carbohydrates found in the cell walls of plants, and it's in the food groups your Nan always told you to eat plenty of, to keep you regular. Also known as roughage, fibre is an essential part of any healthy diet, and helps us not only feel better, but also protects us against heart disease and cancer. There are two types of fibre, and each type has its own health benefits. They are soluble and insoluble fibre, and they affect your body in different ways. Remember that meat, fish and dairy products contain virtually no fibre at all. Soluble fibre. May help reduce the amount of cholesterol that can build up in your body, which can clog your arteries. Beans and lentils are good sources of this healthy fibre. It can also help stabilise your blood sugar, making you feel full for longer, which is why oats are such an important soluble fibre, especially if you are trying to lose weight. Healthy sources of soluble fibre also include nuts, flax seed, oranges and apples and vegetables such as carrots. Keep in mind that if you drink processed apple juice or processed orange juice without the pulp, you are losing most of that healthy fibre. Insoluble fibre. This type of fibre passes through your gut easily, but is not broken down. In that way, it improves your digestive transit, helping you to have regular bowel movements and preventing problems such as constipation and IBS (Irritable Bowel Syndrome). You can get soluble fibre from many sources, including wholemeal grains (bread, pasta etc. ), wheat and corn bran, fruit and root vegetable skins and dark green leafy vegetables. The Government recommends that healthy adults eat at least 18 grams of fibre per day, if not more, with children needing less fibre to stay healthy. For adults, that means five servings of fruits or vegetables every day as part of a balanced diet, as well as six servings of grain products, at least three of which should be wholegrain. 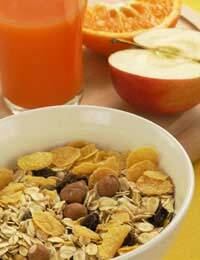 Eating fibre is important but as with any foods, moderation is always the key. If you are not used to eating a lot of fibre, start gradually for best results, or you may encounter some temporary unpleasant gut problems such as bloating and diarrhoea. Drinking at least six glasses of water a day as part of your regular diet is also important, as water plays an essential role in helping fibre pass through the gut. So pass the lentils, peel a banana, eat an orange and drink up – it’s all good for you!